Tis the season of giving and it is important to remember to be thankful for the ones you love – and the ones that care for those you love. A family’s nanny often becomes like a member of the family, providing care and affection for your children when you cannot be around. Regardless of industry, everyone appreciates a holiday bonus and/or gift, including nannies. We often get asked what is industry standard in terms of bonus/gift giving so we thought we would break it down for you. Nannies are just like many people during the holidays and that means they may need some extra money for gift giving or other end-of-year expenses. Let’s be honest, cash is always king and just about anyone would appreciate a cash bonus any time of the year. The bonus amount may vary widely depending on the region in which you live, your family’s income, how many children you have, etc. So, just how much should you give to your nanny? HuffPost notes just how common holiday bonuses are for nannies and what a typical amount may look like, “A new survey by UrbanSitter reveals that 75 percent of parents plan on giving their babysitter a gift or bonus this holiday season, and when it comes to nannies, that number jumps to 97 percent. A holiday gift for your nanny, whether small or large, is a thoughtful way to express your gratitude for the care your nanny provides. Because you get to know your nanny over time, you may want to also consider a more personal gift during the holidays as an expression of thanks for the care they provide for your children. Gifts could include anything you think your nanny might enjoy like a Starbucks gift card, a spa day, jewelry, technology such as an iPad or Apple Watch, a bottle of wine, a restaurant gift card, etc. This gift could be from you, your family, or simply from your children but the heartfelt gesture is sure to be appreciated. Bonuses & Gifts Are More Than A Way to Say Thank You – They Incentivize! 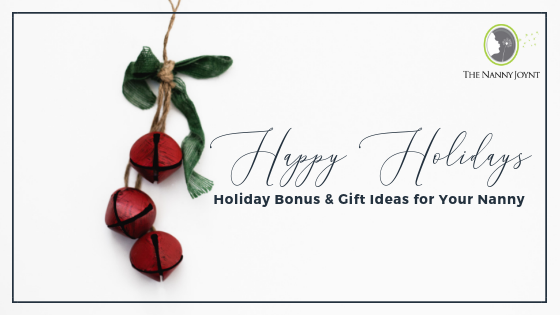 While there are a multitude of reasons for which you may want to offer your nanny a holiday bonus or gift, a holiday bonus or gift helps encourage and incentivize your nanny to provide outstanding care in the coming year. Many research studies have been conducted and have overwhelmingly shown that gifts and bonuses make employees feel seen and appreciated which fosters goodwill and thus makes them want to work harder. It is simply human nature, people like to receive gifts and when it is a gift for their work, they will want to provide that same quality work (or better) going forward. Spread the Love This Holiday Season! The holidays are a time of giving and receiving, a time when we stop to think who we are thankful for and show that thanks with a gift. When making a list of who you plan to give holiday gifts to, be sure to include your nanny on that list. Your children are incredibly precious to you and you entrust them in the care of your nanny. Be sure to show your appreciation for the positive impact your nanny has on your family life and give them a holiday bonus and/or gift.